Commercial — pico ARCHITECTURE inc.
Crosier Kilgour & Partners Ltd., Epp Siepman Engineering Inc., Nova3 Engineering Ltd. and Grant Design Group Inc.
HSC desired to amalgamate multiple business departments into a five storey, mid-century building. 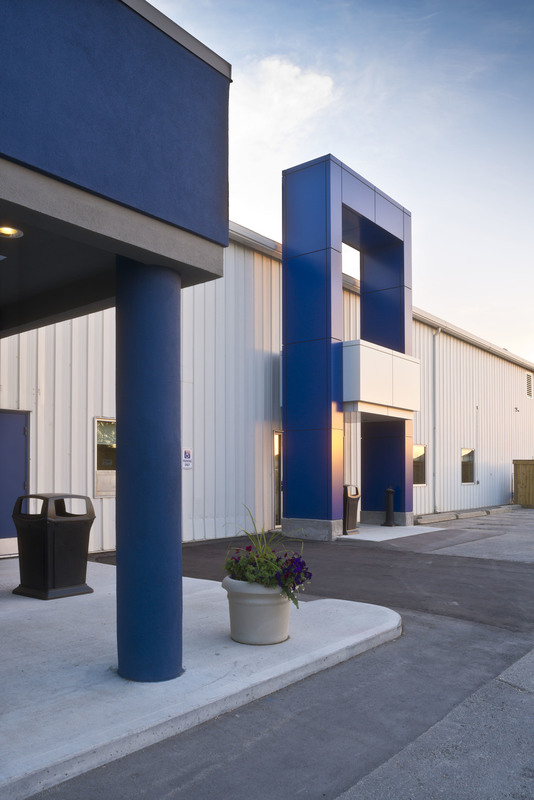 Pico worked with WRHA project management staff, multiple user groups and the HSC Facility Maintenance Department to ensure the needs of all parties were met in the final design. Originally built as a dormitory for medical residents, the existing floor plan was dark, dated and impractical. The design team was challenged by low floor-to-floor heights and a medley of service lines which needed to remain. The project featured several additional challenges including retaining and tying into existing mechanical and electrical services, ensuring staff security, and minimizing disruption to building occupants on higher floors for the duration of the project. The main floor space was demolished to make way for lobby improvements, staff offices, a new reception and waiting area, boardroom, breakout rooms and barrier free washrooms. Mechanical and electrical systems were upgraded; new energy efficient, operable windows added; and security upgrades were incorporated into the new design. The second floor was partially demolished to accommodate a new kitchenette, washrooms and a meeting room. A demountable partition wall system was integrated to accommodate future alterations and reflects the office’s bright, open, corporate image. Furniture was carefully chosen to reflect a professional business operation. Grant Design Group Inc. (Prime Consultant), Crosier Kilgour & Partners Ltd and Nova3 Engineering Ltd.
As the Winnipeg Construction Association began to outgrow their long time home, they engaged Grant Design Group to assist them in searching for a new, larger location. Once the existing building on Waverley Street was purchased, Grant Design Group asked pico ARCHITECTURE to join the team in the development of the renovation. 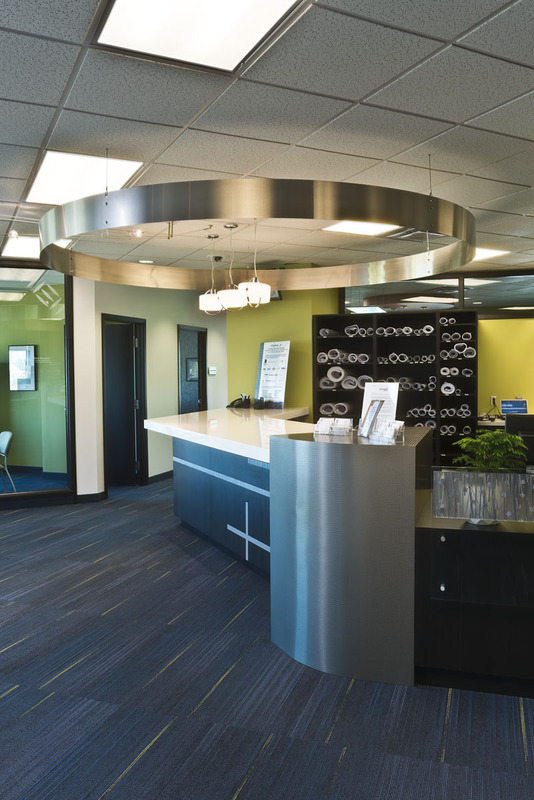 The project included the renovation of office and meeting areas for their full time staff. A portion of the existing warehouse area was converted to an education and training centre for use by members of their association. The client required separate access to the training area, so that the large number of trainees would not disrupt their office function. A new entrance was designed that promoted this wayfinding, yet did not distract from the main entrance area. The portal design of the new entrance was inspired by Winnipeg Construction Association’s original building entrance design. To promote ease of access from the second storey office and support areas to the main floor education area, a new convenience stair was integrated to enhance the interior function and aesthetics. Crosier Kilgour & Partners Ltd., Epp Siepman Engineering Inc. and Nova3 Engineering Ltd. When an existing law office building became available on Main Street in Selkirk, MGEU thought the location was ideally suited to meet the needs of the union – providing visibility on the main business artery in Selkirk with easy access directly from street level. While the location was ideal, the building was uninsulated with dark, cramped interiors. With a long, narrow lot, the challenge was to retrofit the building to provide a contemporary expression, an open feeling, and light filled interiors. Careful planning, creative use of borrowed light and thoughtful positioning of solartube skylighting gave the interiors the required open spaces with natural daylight. Another challenge was creating an open feeling in a long, narrow building with existing low ceilings throughout. The solution was to remove much of the existing acoustic tile ceiling to expose the wood structure. This resulted in a space with much higher ceilings, provided a warm and natural touch to the interiors and was also consistent with MGEUs desire to be as sustainable as possible – reusing the existing building while reducing as many finishes as possible. The project also features LED light fixtures throughout; high efficiency, zoned furnaces; and low flow fixtures for sinks and toilets. 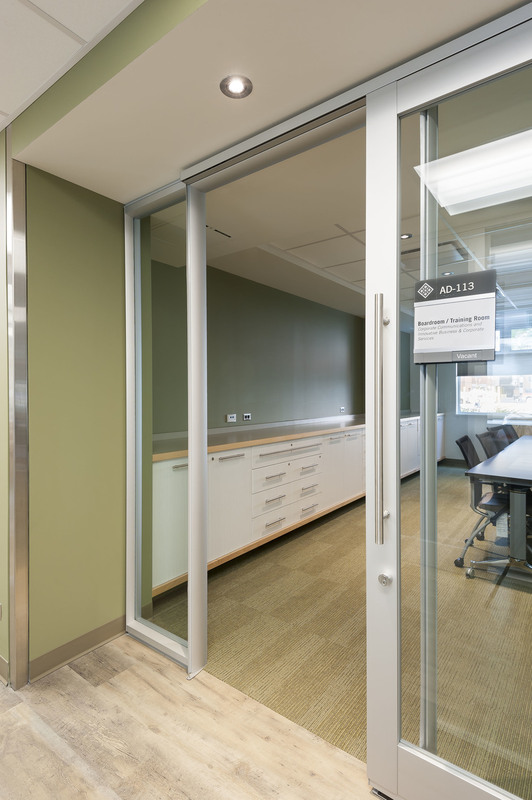 The Manitoba Nurses Union was looking for a space where their members could meet, conduct training sessions and hold small conferences in a welcoming and bright space. Audio visual equipment was incorporated in the main boardroom as well as the smaller meeting room to facilitate training and to maximize the useable space, while maintaining flexibility for the members’ needs. Acoustics were considered for privacy between the meeting room, and boardroom as well as adjacent tenants. A small kitchenette was included to allow for catered functions. The project featured several additional challenges including retaining and tying into existing mechanical and electrical services, and working with the irregular shape of the pre-existing building.